Neuropathy is a collection of chronic disorders that occurs when nerves of peripheral nervous system gets damaged, injured or dysfunctions. Phantom limb syndrome is one of the example of neuropathic pain. This happens when one of the arms or legs have been removed due to injury.Neuropathy can affect the muscle movements and the internal organs such as bladder, blood vessels or intestines. In United States, almost 20 million people suffer from neuropathy. Neuropathy, is classified in three types. Firstly, it is mono-neuropathy, which is involvement of a single nerve.Examples include radial nerve palsy, carpal tunnel, peroneal nerve palsy and ulnar nerve palsy. Second is multiple mono-neuropathy, which involves two or more nerves individually. Last is the poly-neuropathy, which is generalized involvement of peripheral nerves. Neuropathy have several possible causes including diabetes, autoimmune diseases like rheumatoid arthritis and lupus, alcoholism, tumors, liver diseases, amputation, chemotherapy, HIV infection, AIDS, lack of vitamins and kidney diseases.Symptoms of neuropathy include urinary bladder, abdominal pain, nausea, vomiting, diarrhea, exertion, sweat disturbances, genital impotence, numbness and tingling. 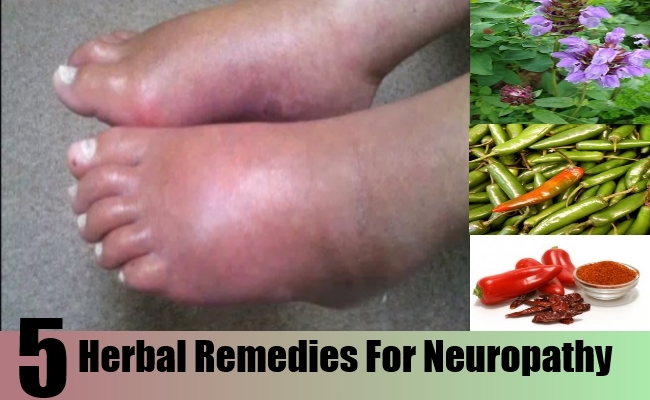 Below given are few essential herbs that will help to deal with neuropathy. Cayenne also known as red pepper is a nutritional herb that is used as a spice and is very often used in medicines. Cayenne pepper has excellent antioxidant properties and is a good source of vitamin A, vitamin C, calcium and potassium.Capsaicin is an active ingredient present in cayenne that is responsible for “hotness” of this pepper. Capsaicin, is a natural pain-killer for numerous pains including neuropathic pain. Cayenne can be taken either mixed with water or added liberally to foods. It is also available in tablet as well capsule form, take 1 cayenne capsule two times a day, preferably with meals. St john’s wort is a perennial herb that helps to reduce the nerve pain associated with peripheral neuropathy, it sometimes restore the healthy functioning of your peripheral nerves. St John’s Wort was popular for casting demons. This herb was classified as a nervine, which is used as a treatment for nervous disorders.Antidepressants, is often used to treat diabetic neuropathy as well other forms of neuropathy. St John’s wort can either be used for massaging or can be taken internally as a tea for it’s antiviral and nervous system tonic properties. Skull cap is a traditional herb that is used as a nerve tonic that helps to relieve from neuropathy symptoms such as nerve damage, muscle weakness and numbness.Skullcap contains flavonoids, bioflavonoids and potent antioxidants that prevent cells from damaging and helps to treat neuropathy. Evening primrose oil is an excellent herb rich in linolenic acid and gamma-linolenic acid that are essential for healthy nerve function. The oil extracts from primrose seeds and is a flowering herb native to North America.Evening primrose oil shows promise in treatment of diabetic neuropathy. It is recommendable to take 4 to 8 grams daily for valuable results. Gingko Biloba is an herbal remedy that may be beneficial in treating neuropathy as well poor circulation.It contains many glycosides and terpenoids and has antioxidant effects, that acts as a relaxing effect on vascular walls, and an antagonistic action on platelet, which is an improving effect on microcirculation and a stimulating effect on neurotransmitters.Gingko inhibits the increase in production of oxidative decomposition (LDL) low-density lipoprotein reduces the cell death in various types of neuropathy. Gingko is well known for it’s ability to boost blood flow to your limbs. Gingko, is to be taken in extract from.Above herbs will work only if you cut down on alcoholism, reduce smoking, caffeine and follow a rich healthy diet that includes more of fruits and vegetables.